Heuristic evaluation has proven popular for desktop and Web interfaces, both in practical design and as a research topic. Compared to full user studies, heuristic evaluation can be highly cost-effective, allowing a large proportion of usability flaws to be detected ahead of full development with limited resource investment. Mobile computing shares many usability issues with more conventional interfaces. However, it also poses particular problems for usability evaluation related to aspects such as limited screen real estate, intermittent user attention, and contextual factors. 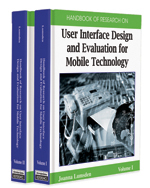 This chapter describes a modified collection of usability heuristics that are designed to be appropriate for evaluation in mobile computing. They have been systematically derived from extensive literature and empirically validated. They therefore offer a sound basis for heuristic-based evaluation in mobile computing. Besides introducing the reader to the practical use of heuristic evaluation, the chapter also closes with a description of potential future research in the area. Heuristic Evaluation: Heuristic evaluation is an expert-based evaluation method in which HCI or usability experts scrutinize the user interface and its elements against established design rules. User-Based Evaluation: User-based evaluation is evaluation through user participation, that is, evaluation that involves the people for whom the system is intended: the users. User-based evaluation techniques include: experimental methods, observational methods, questionnaires, interviews, and physiological monitoring methods. Review-Based Evaluation: Review-based evaluation is an expert-based evaluation method that relies on experimental results and empirical evidence from the literature (for instance from psychology, HCI, etc.) in order to support or refute parts of the user interface design. Usability: Usability is: “The extent to which a product can be used by specified users to achieve specified goals with effectiveness, efficiency, and satisfaction in a specified context of use.” (ISO 9241-11 Ergonomic requirements for office work with visual display terminals: Guidance on usability, 1998). ISO 9241 identifies the following as the most useful indicators in measuring the level of usability of a product: effectiveness in use, efficiency in use, and satisfaction in use. Expert-Based evaluation: In expert-based evaluation, a designer or HCI expert assesses a design based on known/standard cognitive principles or empirical results. Expert-based evaluation techniques are also referred to as expert analysis techniques. Examples of expert analysis methods include: heuristic evaluation, cognitive walkthrough, and review-based evaluation. Mobile/Ubiquitous Computing: Weiser coined the term ubiquitous computing. He also gave a vision of people and environments augmented with computational resources that provide information and services when and where desired (Weiser, M. The computer for the 21st century. Scientific American. 265(3), 91-104, 1991). Dix et al. define ubiquitous computing as: “Any computing activity that permits human interaction away from a single workstation.” (Dix et al., 2003). Cognitive Walkthrough: Cognitive walkthrough is an expert-based evaluation method that is usually performed by experts in cognitive psychology. It evaluates the design on how well it supports the user in accomplishing a task. Context: “Context is any information that can be used to characterize the situation of an entity. An entity is a person, place, or object that is considered relevant to the interaction between a user and an application, including the user and applications themselves.” (Dey, A. Providing architectural support for building context-aware applications, Ph. D. Thesis Dissertation, College of Computing, Georgia Tech, December 2000). Context includes: location (absolute/relative, physical/virtual, etc. ), infrastructure/resources (server and network capabilities and connections, applications), user (user data, usage patterns), environment (physical attributes such as light, temperature, humidity), entities (people, devices, objects), and time (date, time, season). Mobile Device: A mobile device may mean one or more of the following: device that can be carried by the user (e.g., cell phone, PDA, wrist watch, etc), device that is autonomous (e.g., robot), or device (e.g., car computer) that is embedded in a moving object/device (e.g., car) (Dix, A., Rodden, T., Davies, N., Trevor, J., Friday, A., & Palfreyman, K. Exploiting space and location as a design framework for interactive mobile systems. ACM Transactions on Computer Human Interaction, 7(3), 285-321, September 2000). In this chapter, the first and the last are focused on.